It was great fun and extremely beautiful. I don’t think that I had ever been to a real one before. It was all enchantingly traditional with clowns and exquisite horses and jugglers. The audience was perfect and one felt hundreds of miles from the world of culture. Clearly expressing the delight this experience gave him, it is unsurprising that such performances featured in Grant’s oeuvre throughout his career, examples of which can be seen within the Angelica Garnett gift itself. 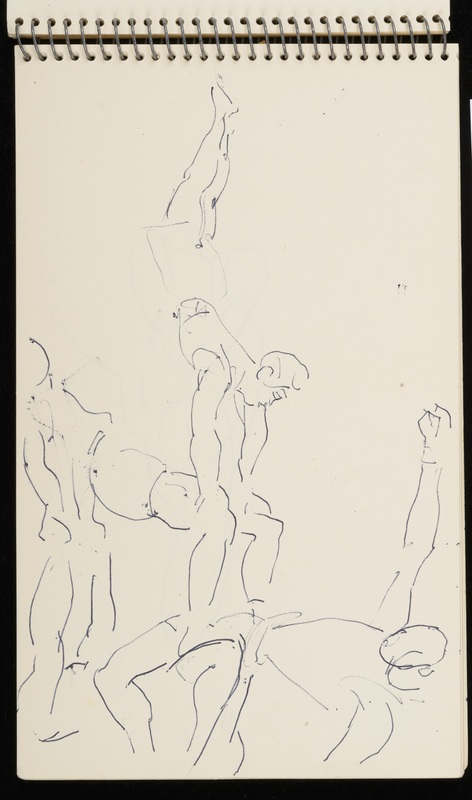 In a sketchbook belonging to Grant from the mid 1950s (CHA/P/590), a series of acrobats and performers tumble across the pages. While some quickly drafted designs offer only the briefest impression of movement – one biro line representing an arm or leg, a circle the head – others are more complete. In one drawing a troupe of muscular acrobats unite in a complex display of strength and balance, each performer’s toned limbs almost indistinguishable from another’s. A celebration of the subjects’ skill and strength, the sketch clearly demonstrates Grant’s interest in the human – particularly male – figure, his skill for observation and speedy reportage, and what one commentator has referred to as the artist’s, ‘childlike delight in theatricals'. Circus themes feature in three of the artist’s paintings at Charleston. In Maynard Keynes’ bedroom, Grant’s Juggler and Tightrope Walker, 1919, hangs above the bed. The work depicts two monumental performers painted in rich tones of red and blue, their oversized yet scantily clad bodies offering a lively scene whose dramatic impact is heightened by the painting’s flattened perspective. Similarly dynamic is his motif of a Chinese acrobat, painted onto the lower panel of the door in Clive Bell’s study. 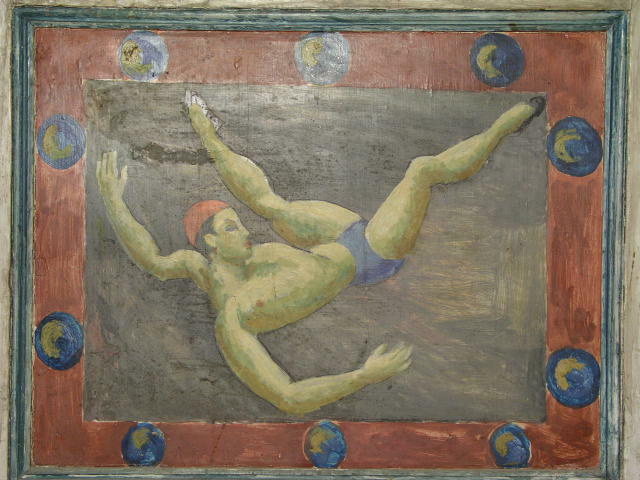 Captured in mid-summersault, the acrobat was painted onto the panel in 1958, replacing a previous version that had been smashed by Quentin Bell and his brother Julian during particularly violent parlour game much earlier in 1918. The third painting, Two Acrobats from 1966, offers a joyful celebration of agility, movement and colour. While not in Charleston’s collection, Grant’s painting Circus from 1923, now in the Government Art Collection, clearly demonstrates the enjoyment and excitement that such performances offered the artist. Painted from the viewpoint of an audience member, the artificial glow of the stage lights and compacted picture plane impart a palpable impression of immediacy and excitement, emotions clearly felt by the artist on attending such spectacle. It is possible to identify this influence in other works of unrelated themes. Two early paintings in Tate’s collection, Bathing and Football clearly demonstrate Grant’s interest in physicality and movement. In both works, the toned muscles and poised limbs of the athletes combine with the dynamism created by the artist’s clever use of perspective and flattened plane to create spectacular demonstrations of the speed, strength and agility of the human form. St. Blaise Chapel mural, Duncan Grant, c. 1958. Oil on panel, Lincoln Cathedral. Photo © Richard Croft and licensed for reuse under this Creative Commons Licence. This current of theatricality remains strong in later works. In Grant’s mural scheme for the St. Blaise Chapel at Lincoln Cathedral, completed in 1958, a group of shirtless labourers carry bundles of wool into a boat to the right of the composition, their muscular forms stretching, pulling, kneeling and climbing in their task. Dressed only in brightly coloured shorts or suspiciously modern-looking white briefs, these figures appear completely at odds with their historical setting and the other figures in period dress; they would be better suited to scaling a Big Top’s trapeze than the rigging of a medieval boat. Designed shortly after the acrobat drawings in the sketchbook, it is quite possible that Grant borrowed from them directly when designing the scheme. 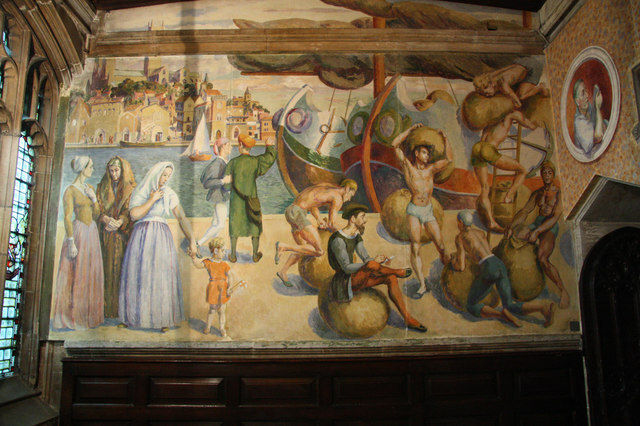 In his discussion of the murals, art historian Simon Watney suggests that the closure of the chapel in the 1960s and its conversion to a storeroom – where the murals would be hidden until 1990 ‘behind heaps of clerical detritus’ – was likely to have been in response to the frank sensuality of the labourers. While perhaps at one time too overtly expressive for their spiritual location, the mural’s energy and vibrancy clearly demonstrate that Grant’s ‘childlike delight in theatricals’ continued to influence his creative practice in his later years. A very similar painting to the design in Bell’s study was sold at Christie’s Auction House in 2014. The work is inscribed ‘Chinese Theatre Co’. Perhaps Grant visited the theatre and drew inspiration for both works. Another of the sketches in CHA/P/590 is of a performer in oriental style dress. Grant’s equally vibrant study for the murals, The Wool Staple in Medieval Lincoln c. 1957, can be seen in the Usher Gallery’s collection.